Recently a friend was informing me about the intelligence of octopuses (I have found that the use of ‘octopi’ is actually incorrect – unless you want to sound Latin). I then relayed this information to some other friends… two days later I was hit in quick succession by some visual and auditory references to octopus. The first was a video of the Mimic Octopus (featured below), the second was on the Twis podcast I was listening too. I was intrigued to say the least and after sending some emails around decided to make a more consolidated effort here – hopefully you find it interesting. Octopus have three hearts and nine brains. An octopus is more closely related to an oyster or a snail than to any other species of animal. A female octopus dies once her young are ready to be born. This means that each generation of octopus learns about its world from scratch. The octopus can change its skin colour, markings and texture at will and quickly. They can even take on the texture of the ocean floor. It is an intelligent shape shifter that can disguise itself in myriad ways. An octopus knows exactly how big it is and will not attempt escape when confined if the door is too small. Quite a number of these facts refer to intelligence or learning (I coloured these references blue). The above video talks about how it can shape-shift to scare away prey. Linking this to the fact that a baby octopus “learns about its world from scratch” implies it must watch and observe its environment, learning these defence tactics. Below I will retell the story about octopus learning that my friend passed onto me, the one which started this octopus escapade. But firstly another video of the Mimic Octopus (I found this guy really interesting and really wanted to go see one!). Another video of the Indonesian Mimic Octopus. Researchers were looking into the ways octopus learnt. They sourced octopus from the local fisherman who would often catch them in their fishing nets. One such ‘control octopus’ is put into a tank were it retreats underneath a log; scared of its new surroundings. A clear acrylic puzzle containing a tasty crab is placed into an adjoining tank housing an octopus who has resided there for some time. The puzzle can be opened on several of the sides, each side requiring a different method. One side might require a cap to be screwed off, whilst another might be to be simply pulled off. The octopus in the adjoining tank is familiar with the puzzle and welcomes the easy meal swimming right up to the acrylic puzzle. As the octopus grapples with the puzzle the newly located octopus takes an interest, first watching from under the log and then coming out for a closer look. In fact, it soon presses up against the glass becoming visibly excited as the puzzle is solved and the tasty/poor crab is obtained. The tanks are then isolated using an opaque divider and the same puzzle is placed into the new octopus’s tank. The new octopus swims straight up to the puzzle and solves it in the same way it has just observed. The orientation of the puzzle did not have any effect, the new octopus would instantly isolate the side it knew how to open to seize its prize. Observational learning exhibited by octopus vulgaris. It turns out there has been interest in octopus learning for some time. 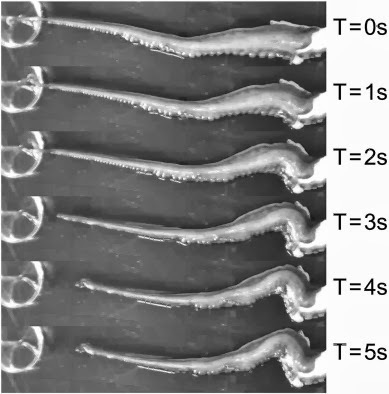 The earliest paper appears to be Observational Learning in Octopus Vulgaris (Fiorito & Scotto 1992) where, similar to the above experiment, untrained octopuses observe a ‘demonstrator’. In this experiment two coloured balls where used: red and white. In one group the red ball was considered to be the ‘correct choice’ and when an octopus selected/attacked this colour they received a tasty piece of fish. If they selected the white ball they were punished by a small electric shock. In a second group these conditions where reversed. There has been earlier evidence of the problem solving prowess of octopuses, for example Jacques Cousteau filmed an octopus opening a corked jar back in the 1950s. Even earlier (around the 200A.D.) the Roman natural historian Claudius Aelianus described octopuses, saying that the ‘mischief and craft can be plainly seen in the characteristics of this creature’. Some footage by Jacques Cousteau. In particular: an octopus opening a corked jar. drilled elsewhere on the shell, or pulled the snail out by sheer force. Octopus blocking den entrance and Joan Boal expressing some scepticism. Despite this seemingly intelligent/human behaviour, respected cephalopod researcher Jean Boal is questioning if the octopuses are really intelligent or if they are just demonstrating what we would consider intelligent behaviour. Maybe they are just exhibiting fixed complex behaviours? She, as well as others, have been unable to reproduce the observational learning results demonstrated by Fiorito. In contrast octopuses are neither long-lived and appear to be solitary, non-social creatures. “The natural lifespan of a giant Pacific octopus is only three [or four] years” and the longest living octopus, the Arctic octopus lives to only six years. Jennifer Mather believes “the event driving the octopus toward intelligence was the loss of the ancestral shell”. This made octopuses more mobile allowing them to actively seek food, but also meant that they had limited protection from larger predators. To solve this problem they had to develop intelligence to camouflage and deceive potential threats. There is however growing evidence that octopuses are communicating more with others of their species than researchers previously realised. “Cigliano found that California octopuses that were kept together quickly established hierarchies and avoided wasteful, dangerous confrontations; the weaker animals seemed to recognise and yield to the stronger ones, even when the latter were hidden in their dens.” Peter Godfrey-Smith has also seen two octopuses living just two feet apart for more than a week on his dives in Sydney Harbour, Australia. He has also visited a diver further down the coast who has found a group of octopuses living together and interacting. Off the coast off the (Felix) Anton Dohrn Institute near Capri, octopus have also been observed to be living amongst other octopuses becoming more dominant in their environment; prey becoming predator. They have began to interact and observe each others behaviour, the younger octopuses possibly learning from those older. Could this be a quantum leap in the evolution of this species? An end to the vicious cycle of coming into the world with no adult to learn from? Perhaps the octopus’s horizons are expanding! I was quite interested in the fact octopuses have nine brains. After some more research I found that octopuses have large nervous systems, centred around relatively large brains (which is in a doughnut shape around their oesophagus). It turns out that around three-fifths of octopus’s 500 million neurons (close to the number in a dog) are found in the arms themselves! These neuron clusters at the base of each arm are something akin to a brain. The octopuses have a central brain as well as concentrations of neurons at the base of each of their eight legs. In another experiment the researchers killed a number of octopuses (which is sad – see European Union directive below) and then kept the removed arms in cold seawater for up to an hour (n.b. octopus can regrow their arms – but obviously not when they have been killed). They then took the arms, some of which were suspended, and other which were laid out on a flat surface and proceeded to pinch/prod the arms and also expose them to tap water and acid. All the arms regardless of the orientation coiled away from the stimulus source within one second. In science terms, the arms exhibited reflex-withdraw to a noxious stimulus, without reference to the (main) brain. 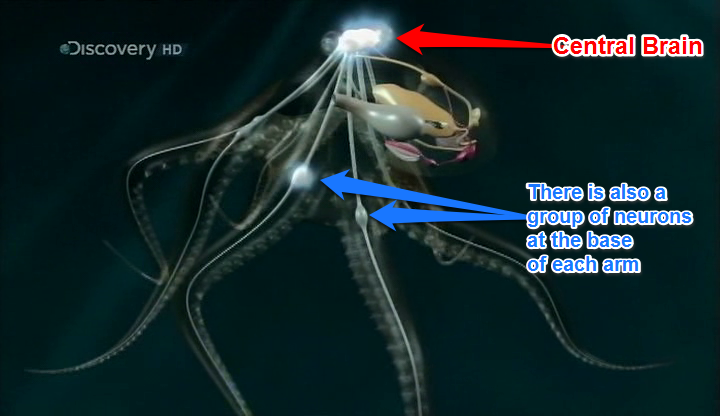 This supports the idea that octopus have nociceptors (neurons which respond to physical danger) in their arms. In humans these are located in the spinal chord meaning a severed arm would not respond to pain. An octopus tentacle pulling it away from a petri dish with acid in it. Hopefully you found octopus as interesting as I have. For the last few days I spent every spare moment researching and compiling this information. Below are links/references you might want to look at if your appetite is not fully sated. Gutnick, T., Byrne, R. A., Hochner, B., & Kuba, M. (2011).